In 1879 a French surgeon first described the existence of a fibrous band on the anterolateral aspect of the knee. Over the years, since then, similar structures have variously been described in the human knee, however, there was no clear anatomical description and its function was unknown. 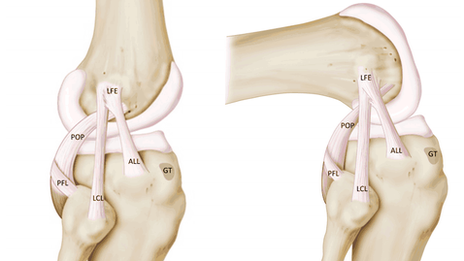 In October 2013 two Belgian knee surgeons published a paper in the Journal of Anatomy describing the structure in detail and have named this ligament the Anterolateral Ligament (ALL). Dr Claes and Professor Johan Bellemans hypothesis that this new ligament may play an important protective and stabilising role as we twist or change direction. As further research is carried out on the function of this ligament it may help us better understand and treat a very common sports injury – the anterior cruciate ligament (ACL) tear. Despite improvements in surgical techniques around 10-20% of people with repaired ACL tears are unable to recover fully. One of the possible complications after surgery is that the knee will continue to give way as patients twist or turn. Could this be due to the ALL also being ruptured? At the moment this is all hypothetical and clearly further research is required to elucidate its exact function, but if the ALL is found to have a role in providing rotational stability to the knee, then this may have significant implications for surgery on the knee. This entry was posted in Injury Management and tagged ACL tear, Anterolateral ligament, new knee ligament. Bookmark the permalink.